SDRR's interface changes depending on which mode you have selected. Some might argue that the market for saturation plugins is itself fairly saturated, but we now have a new one to consider in the form of Klanghelm's SDRR. Offering four modes - Tube, Digi, Fuzz and Desk - and able to respond dynamically to the input signal, this promises all the controls you need to tweak the effect to perfection. As well as operating as a saturator, it can also serve as a compressor, an EQ, a bitcrusher or a subtle stereo widener, while the Drift control is on-hand to help you to add some movement to your music. 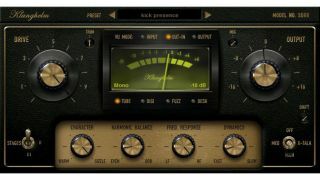 SDRR is available from the Klanghelm website in VST, AU and RTAS formats (32- and 64-bit). It costs €22.